Home > Cook Yummy > Course > Drinks & Juices > Raw & Green Wine Detox Buzz! Place all ingredients in a blender and blend on high for 2-3 minutes, until smooth. You will hear the aliveness of this elixir after freshly blending. It literally bubbles & breathes with vibrancy! The beauty of this recipe is its versatility! Sensitive to cilantro? Replace it with kale! or add kale to the whole mix. Feel free to leave anything out, if it is not to your tastes as no one single ingredient, other than the grapes, makes or breaks here. But every ingredient listed here is a nutritionally valuable superfood designed to detox, rejuvenate and buzzzz! 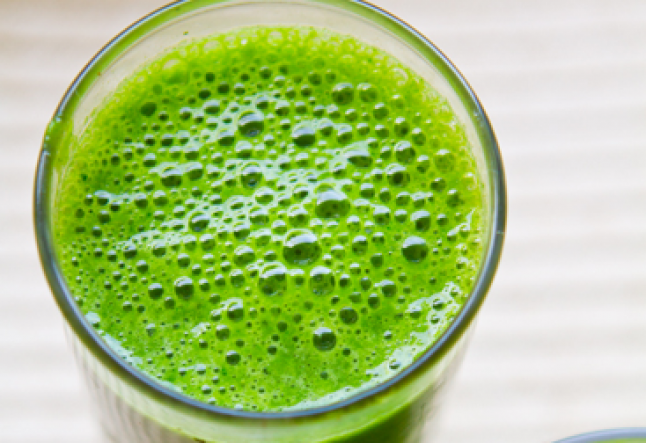 This is a powerhouse detox elixir, sip, savor, enjoy!